Allison Kane is a licensed pediatric speech language pathologist and the owner of Tri-County Therapy. Allison received her undergraduate degree from Columbia College in Speech-Language Pathology. She received her Master’s degree in Communication Disorders from the University of South Carolina. Allison is a certified member of the American Speech Language Hearing Association (ASHA), the South Carolina Speech and Hearing Association (SCSHA) and is licensed within the state of South Carolina. Allison has received credentials for becoming an IBCCES Certified Autism Specialist. In addition to holding a professional interest in Autism Spectrum Disorders, Allison has two children on the Autism Spectrum. Allison loves working with families of similar experiences and guiding them through the challenges of Autism services and supports. Allison has always been a huge advocate for early intervention, and she has seen first-hand the effects that early detection, therapy and intervention have played in her children’s lives. 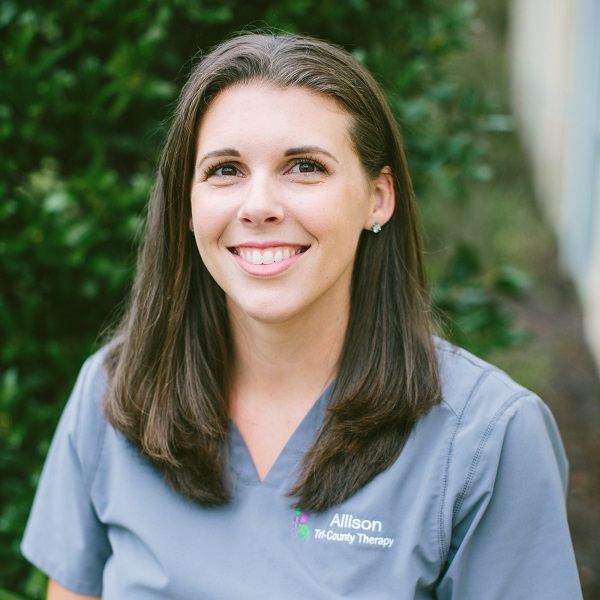 Allison and her team have a reputation for being caring, passionate, and highly skilled. In her spare time, Allison enjoys spending time with her family: her husband, Chris, and their three boys- Brandon, Dylan, and Logan.